Bob Carter: innumerate and irrational? So what about the famous global warming which occurred in the late 20th century, whatever happened to that? Well, not only did the gentle warming terminate in 1998, but in accord with natural climate cycling that warming has been followed by a gentle cooling since about 2001. Thatâ€™s ten years of no temperature increase, let alone dangerous increase, over the same time period that atmospheric carbon dioxide increased by about 5%. Run that past me again, Professors Garnaut and Flannery â€“ your advice to government still remains that human carbon dioxide emissions are causing dangerous global warming? The statistical evidence did not stop assertions in the public debate that the earth was cooling, but it does seem to have discouraged at least the numerate and rational from repetition of errors into which they had carelessly fallen. So where does that leave Carter, I wonder? I think we can rule out his being careless in the presentation of the facts. And he can’t really be innumerate — the Royal Society of New Zealand does not welcome the mathematically challenged to its ranks. Irrational? How else do you describe someone who argues the exact opposite of the truth? What’s the term I’m striving for? Is he being economical with the truth or simply telling lies? I leave that for the reader to decide. Author GarethPosted on March 11, 2011 March 11, 2011 Categories Climate cranks, environment and ecologyTags Bob Carter, cooling, cranks, Ross Garnaut7 Comments on Bob Carter: innumerate and irrational? Climate talks heat up in Mexico, snow blankets Britain and much of Europe, and The Climate Show is at the heart of the action. Glenn and Gareth set the scene for COP16 in Cancun and then interview Oxfam NZ’s Barry Coates at the conference to find out how things are shaping up. Gareth explores the link between Arctic climate change and cold winter weather in Western Europe, John Cook debunks that favourite sceptic myth — that the world’s cooling — and we look at the potential for nuclear power to provide part of the solution to decarbonising the power economy. …below is the Greenland data for the past 10,000 years (Holocene) from the published paper by Cuffy and Clow (1997), two distinguished US scientists. Note that temperatures for almost all of the past 10,000 years have been warmer than present. Data Contribution Series #2004-013. NOAA/NGDC Paleoclimatology Program, Boulder CO, USA (ftp download here). The most recent temperature data point in that series is 1905, and that’s the point Easterbrook labels as the present. To make his case he has to make a full century’s worth of warming disappear. The 300 years of recent warming are of course the 300 years up to 1905. What has happened since then is manifestly significant. This sort of misdirection is par for the course for Monckton, but what about Easterbrook? 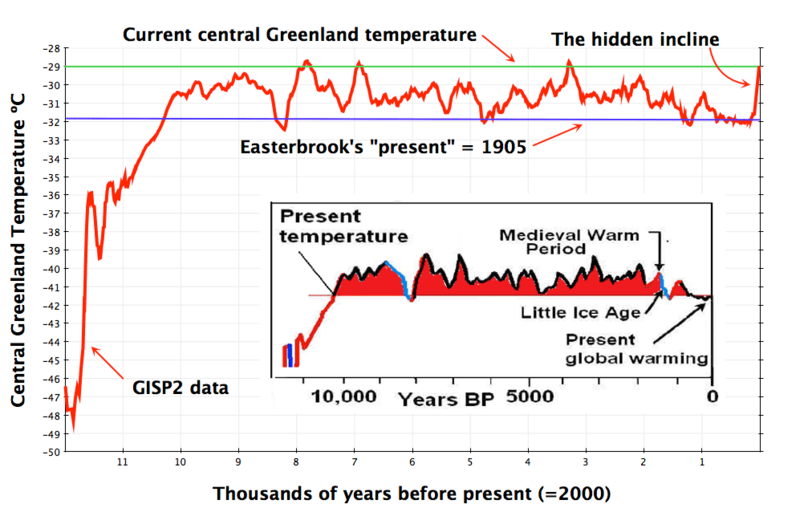 If he knowingly misrepresented 1905 as the “present” (and given that he claims to have “the entire Greenland oxygen isotope data in my computer and use it extensively to plot data” that has to be a real possibility), then he is clearly misusing the data and misleading his audience. The intellectual dishonesty involved is breathtaking. His audience may want to be mislead, but that is irrelevant. On the other hand if, as a distinguished academic with a long career studying (amongst other things) glaciers and climate change, he really doesn’t know that the data series stops in 1905, then he is demonstrating ignorance of a sort that would embarrass any student. Looking at how past disclosures of fraud in the global warming debate have been dismissed or ignored by the mainstream media leads me to suspect they will try to sweep this, too, under the rug. But thanks to the Internet, millions of people will be able to read the emails themselves and make up their own minds. This incident, then, will not be forgotten. The journalists who attempt to spin it away and the politicians who try to ignore it will further damage their own credibility, and perhaps see their careers shortened as a consequence. How very true. I look forward to Bast issuing a statement apologising for being a party to Easterbrook’s fraud, for providing him with a platform to mislead and misinform, and instituting an in-depth investigation into the background of Cooling-gate. But I suspect he will be doing his best to ignore the whole affair. I leave it to the reader to decide what that does for the credibility of Bast, Heartland, and the scientists who shared a stage with Easterbrook at Heartland’s Chicago conference. CONCLUSION — THE ‘FAKE DATA’ CHARGE BY THE ‘TRUFFLE GROWER’ IS A COMPLETE LIE–THE DATA COMES FROM THE WORLD STANDARD OXYGEN ISOTOPE RECORD FROM THE GREENLAND ICE CORES, AND THE RECENT TEMPERATURE DATA IS FROM SATELLITES. ALL OF THIS DATA IS EASILY AVAILABLE FOR ANYONE WHO WANTS TO PLOT THEIR OWN GRAPHS. THE CHARGE THAT THIS DATA HAS BEEN ALTERED IS A DISPICABLE LIE. Unfortunately for Easterbrook’s credibility, all he’s done is confirm his own mistakes. He not only attempts to defend the wrong graph, but confuses me with Tim Lambert and underlines the considerable statistical naivety in his analysis of recent global temperatures. To make matters worse, a pixel-by-pixel comparison of Easterbrook’s slide nine and the Global Warming Art equivalent shows that they are a perfect match — confirming my original charge: that Easterbrook had crudely altered the GWA original to better suit his storyline.